Notre Dame and Under Armour has rolled out the 2018 Shamrock Series uniform we will see the Fighting Irish take the field at Yankee Stadium in. The theme for Notre Dame this year is pinstripes, paying homage to the Yankees. The base of the uniform is navy blue with both the helmet and jersey being navy color, the helmet gets a special pinstripe circle decal with the ND laid within and gold speckles on the facemask. The jerseys feature a pinstriped shoulder pattern with Notre Dame spelled out in cursive across the chest matching the same font as the Yankees. 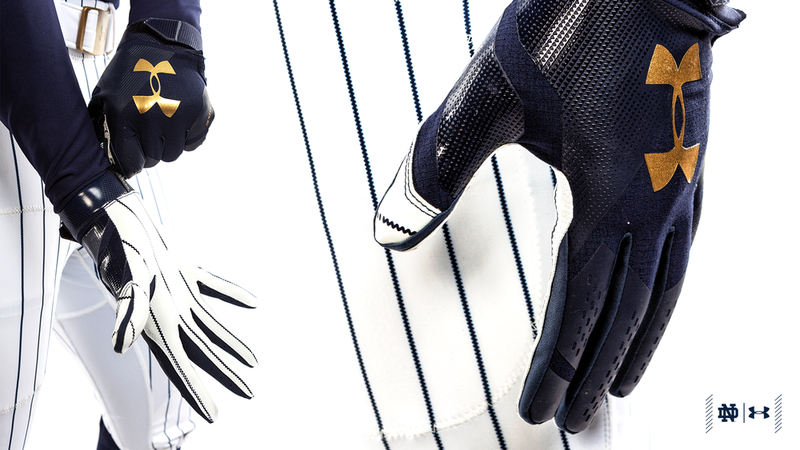 The same pinstripe from the shoulders is found on the pants giving the team the same look as the Yankees have when they take the field in their pinstripe uniforms. The accessories for the Shamrock Series embrace the pinstriping as well with the gloves having the stripes on the palms and the cleats having the pinstripes start at the bottom and come up. The overall look is a great nod to the Yankees and Notre Dame will definitely look like the home team come November 17th.